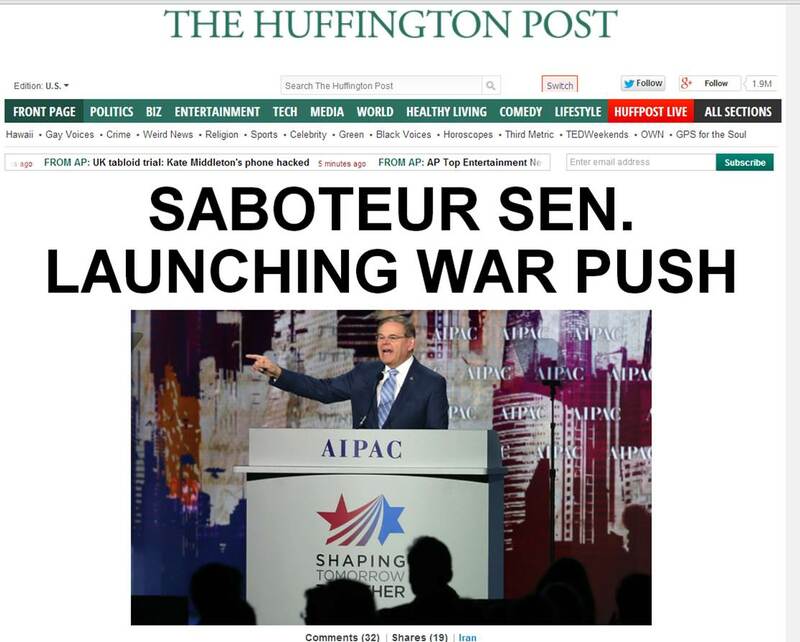 A few weeks ago, we reported on how The Huffington Post has been one of the few news outlets to choose sides in the heated debate in Washington over a bill which would authorize more sanctions on Iran if the latter breaches the terms of the agreement it endorsed in Geneva. In December, HuffPost accused Democratic Senator Robert Menendez, chairman of the Senate Foreign Affairs Committee, of being a “saboteur senator” due to his stand on sanctions. The photo accompanying the article showed Menendez speaking on a podium with the AIPAC logo clearly visible in the background. 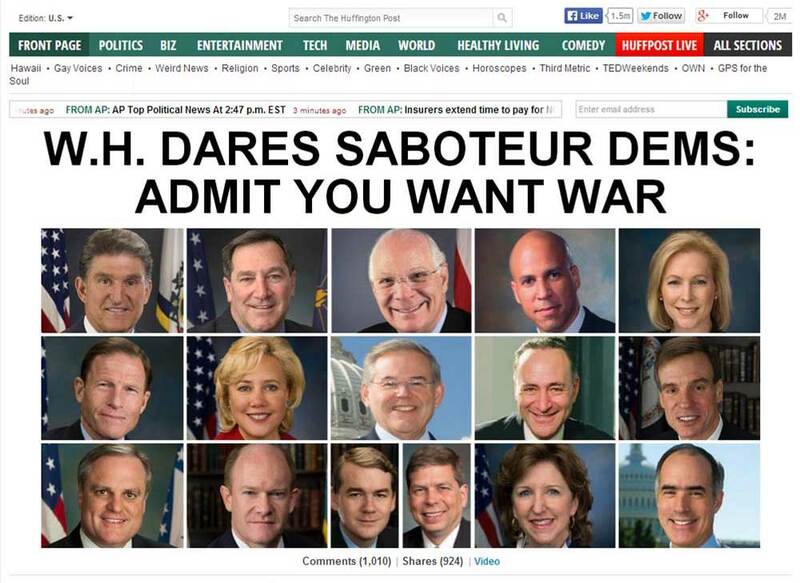 The article’s explosive headline was toned down amid a flurry of criticism, but soon enough HuffPost was at it again – this time with a story titled ‘White House Dares Saboteur Dems: Admit You Want War,’ accompanied by portrait shots of said saboteurs splashed all over the site’s homepage. This headline, too, was toned down, and as of this weekend no trace could be found of the word ‘saboteur’ in the article. However, even in the whitewashed version, the implication was clear: the voices in Washington urging caution over the deal with Tehran are saboteurs. Meanwhile, The Washington Post published an op-ed by Menendez himself outlining the need for more caution in the form of an “insurance policy” to be used if negotiations for a diplomatic solution flop. Elsewhere, the paper reported that the majority of senators support the legislation, a statistic conspicuously absent from Huffpost‘s saboteur story. Perhaps HuffPost has merely decided to follow party line: apparently, even the White House itself has taken to painting pro-sanctions Democrats as warmongers, as The Daily Beast reported. We’ll keep you updated as we remain on the lookout for balanced HuffPost coverage of the debate.